As humans, we’ve evolved to carry our babies. Inventions like prams, car seats and bouncy chairs are all very recent in terms of human history. Present-day baby carriers are one way to carry your baby that enables you to have your hands free to get other stuff done. There are so many benefits to carrying your baby – for both you as a parent and for your child. Using a baby carrier is shown to reduce reflux in babies, and eases the discomfort for babies who suffer from reflux. The upright position keeps the stomach acid in the stomach, using gravity as the aid. The calm motion as you go about your day, very gently massages your baby’s tummy, helping with digestion. Carrying your baby is known to prevent wind too. Babies are naturally very nosy! Your baby might lift her head from your chest to look at you or at the outside world. This helps her to develop her core muscles. Your baby’s development improves by watching your movements, learning from your facial expressions and hearing your familiar voice right there. Independent studies show that babies who are worn in a carrier, cry less! The “4th trimester” is an important part of a baby’s transition to the world – the change from being in the womb to being part of a bigger, wider, lighter world. By holding your baby close, it helps her to make this transition and offers security and reassurance. Baby carriers and baby slings give a safe place for your baby to feel close to you. This reassurance means your baby feels secure and loved, which aids brain development at a crucial age. Oxytocin is a hormone related to bonding and attachment, often called the “love hormone”. Oxytocin is released in both adult and baby when you have skin-to-skin contact with your child, and oxytocin is released with close, loving touch. Oxytocin will drastically improve your mood. Carrying your baby is an easy way to get an oxytocin boost, and therefore reduce the likelihood of post-partum depression. When you’re a new mum, it’s a steep learning curve to get to know your baby’s cues. This is especially true for first-time mums. Holding your baby close to you in a baby carrier or sling helps you to pick up your child’s subtler cues more easily. This builds bonds and positive attachments between you and your child, and enables you to quickly meet your baby’s needs. Carrying your baby is a wonderful way to soothe and comfort your baby, reducing the amount of stress for both you and your child. 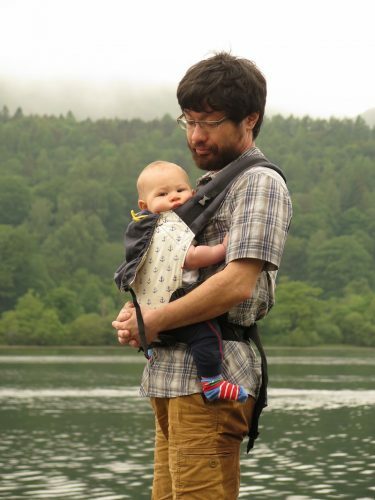 The extra weight of carrying your baby – although a well-fitted baby carrier will support that weight and feel comfortable for you – is a great form of exercise. Even a short walk each day will burn calories! Breastmilk production is boosted with skin-to-skin and close contact with your baby. Your sling or baby carrier will also make it easier to feed when you’re on the move. Some mums find that the hood on their baby carrier can make feeding in their sling more discreet, too, if that’s a consideration for you. Carrying baby, juggling bags, sorting laundry, eating something yourself – it can seem like you need the arms of an octopus to get everything done with a baby or young child! We’re not going to pretend that your baby carrier will give you 6 extra arms, but a baby carrier does give you the full use of both your hands. Parents have told us that sorting laundry, doing gardening, getting the weekly shop sorted, and hoovering are all simpler with a comfortable baby carrier. These are just a few benefits of carrying your baby, there are many more hidden benefits you will enjoy if you choose to carry your child.